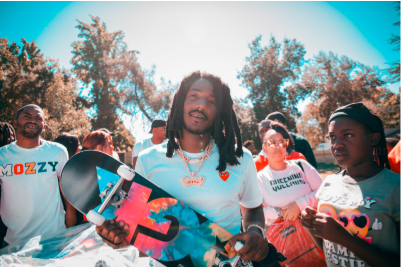 LOS ANGELES, CA (October 8, 2018) – On Saturday, Sacramento-bred rapper, Mozzy, hosted the Provide For Your People giveback event at Fourth Avenue Park in Sacramento, CA from 10am-2pm. In addition to repaving the basketball court, Mozzy gifted 400 members of the community with haircut vouchers, backpacks, school supplies, shoes, gift certificates and more. Activities included games, face painting and jump houses along with a variety of food vendors. Last week, Mozzy dropped his new album Gangland Landlord via Mozzy Records/EMPIRE.